Well, I need a little break from tiling. There will be a lot more to do but while I was waiting for tiles to set, I would get these ideas and start navigating. These are just ideas of how to complete the decoration of the house with objects that would make it even more unique. 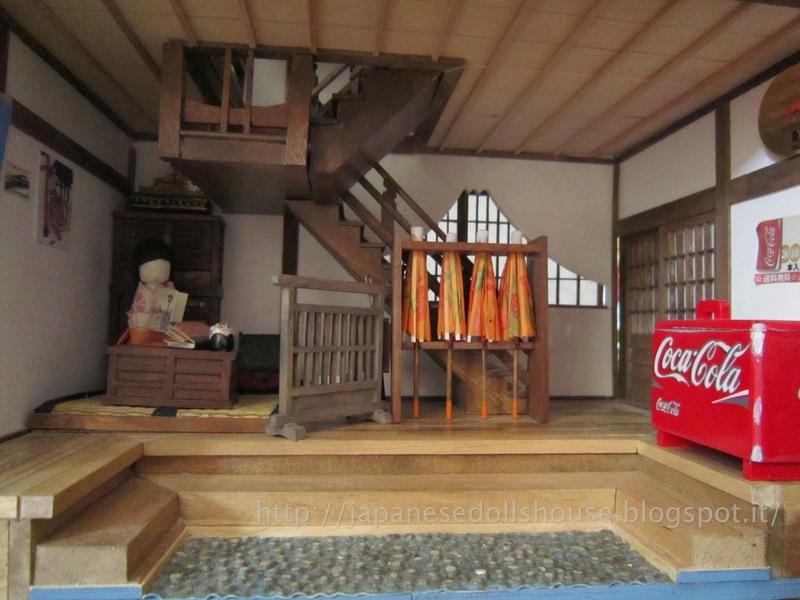 While surfing, I came across a lot of miniature Japanese diorama and nearly all of them had scrolls and such decorating the walls. But one artisan had kites! 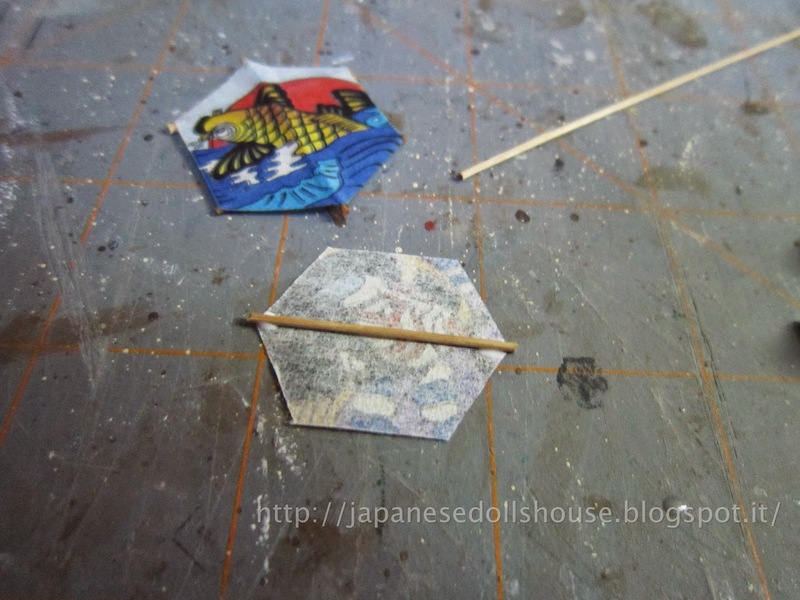 I had forgotten about Japanese kites! They are great for filling in wall areas. So I found some images and printed them out. Kite paper is very light and at first I thought I would use tissue wrapping paper. But then I remembered I had some calligraphy paper which is also very light, transparent and beige in color. I don’t want my kites to look new. So I had to tape the paper to another sheet so it would pass thru the inkjet printer without getting “eaten”. Once that was done, I could start cutting and making the kites. I used some left over pieces from the kit to make the supports for the back of the kites. 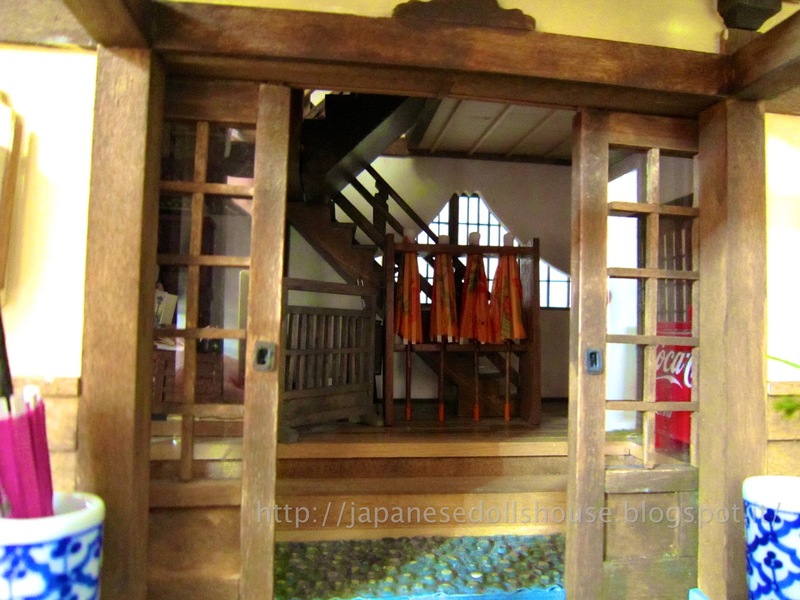 The koi fish kites (koinoburi) were made wrapping around a paint brush to maintain the wind sock kind of shape. 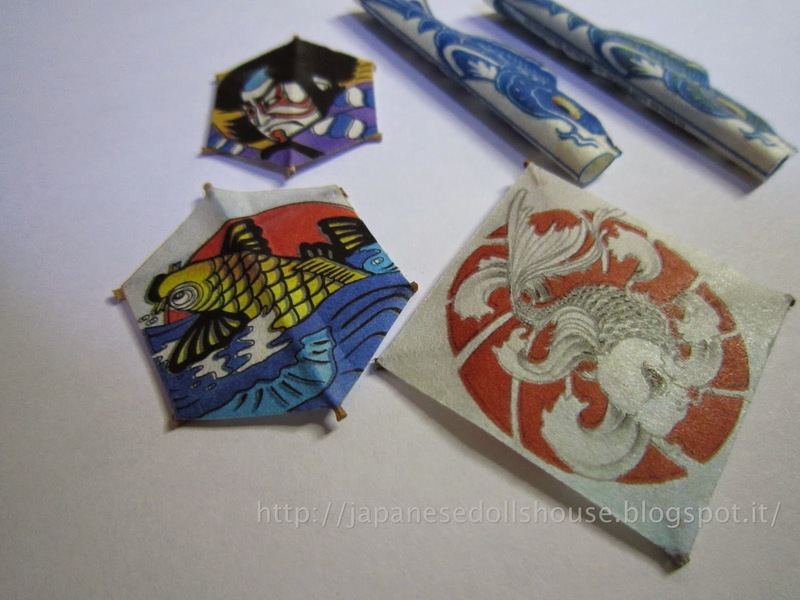 Basically these koi kites are used during the children’s festival in May and each koi represents a member of a family. Black is the Dad, red the Mom and so on. So I just made a family adding one blue and one green for a boy and a girl. They are usually hung from a roof but I imagined mine hanging from a kite wand (seen on the internet if you want to buy one) from one of the porches. 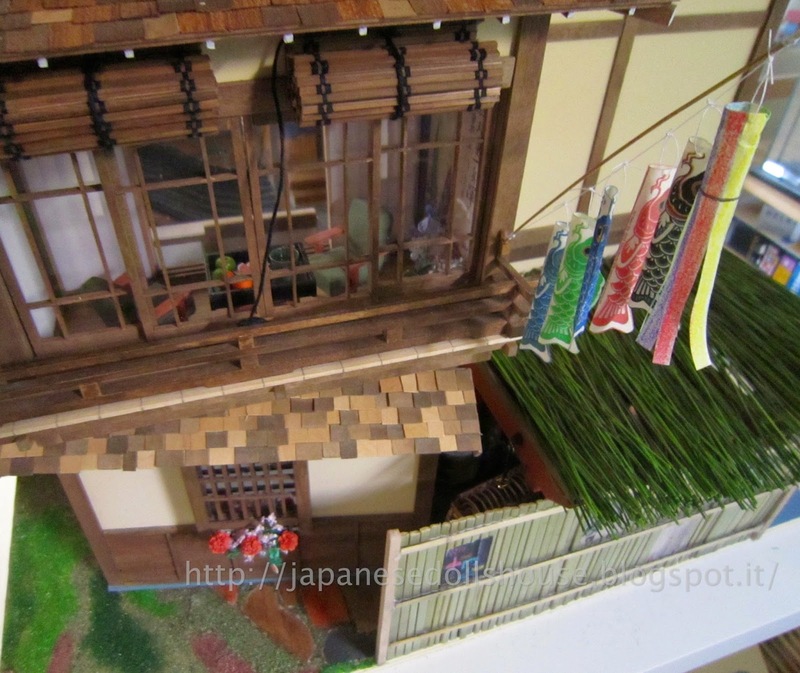 Since the bamboo room is a more permanent type bedroom, I figured that could be the owner of the ryokan’s room. Or someone with numerous family members. 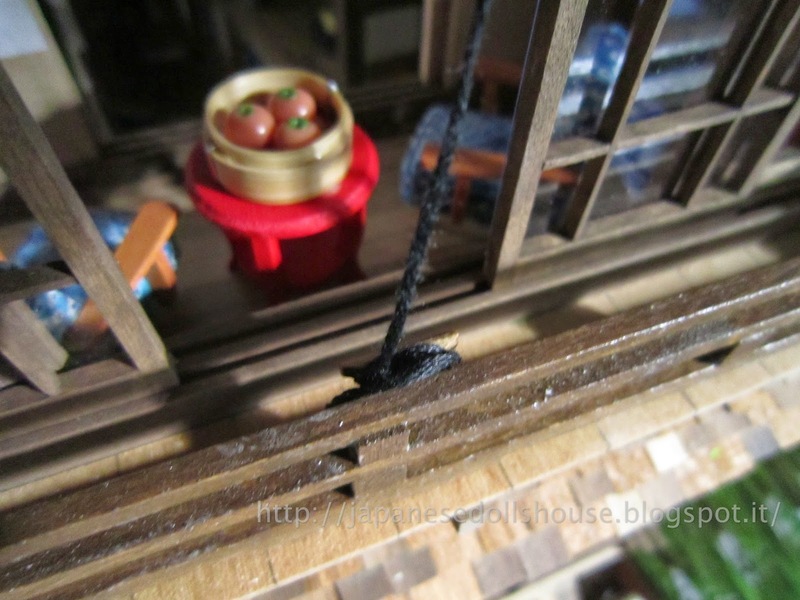 Anyway, I chose the first floor porch for the koi kites. It took a little time to cut them out, glue them and tie string to each one but I think the final effect is very cute. They even look like they are hanging from a fishing rod. 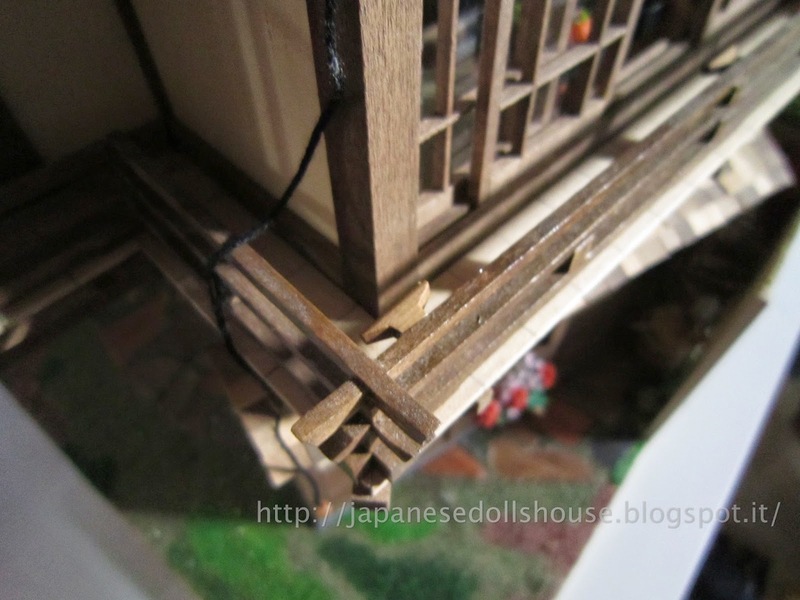 Printed on calligraphy paper and gluing small supports. 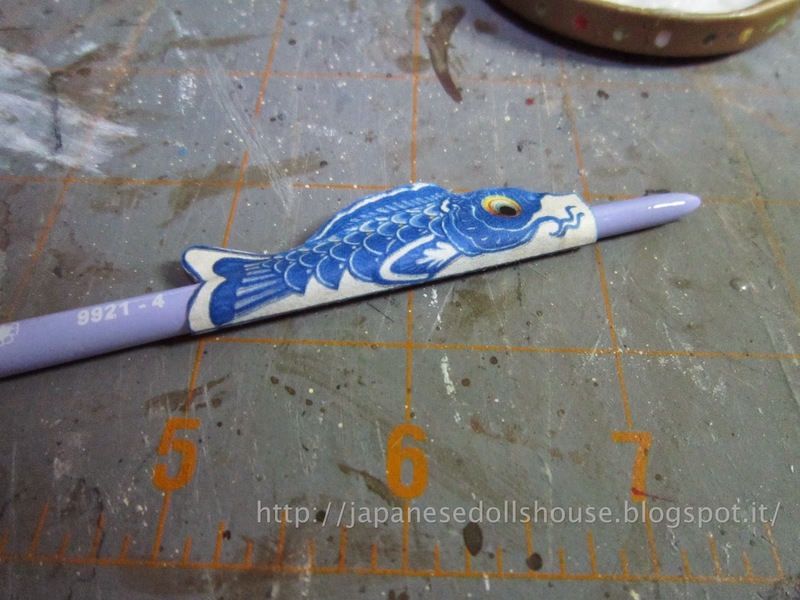 Working on the koi fish kite. Finished kites ready for some string and mounting. 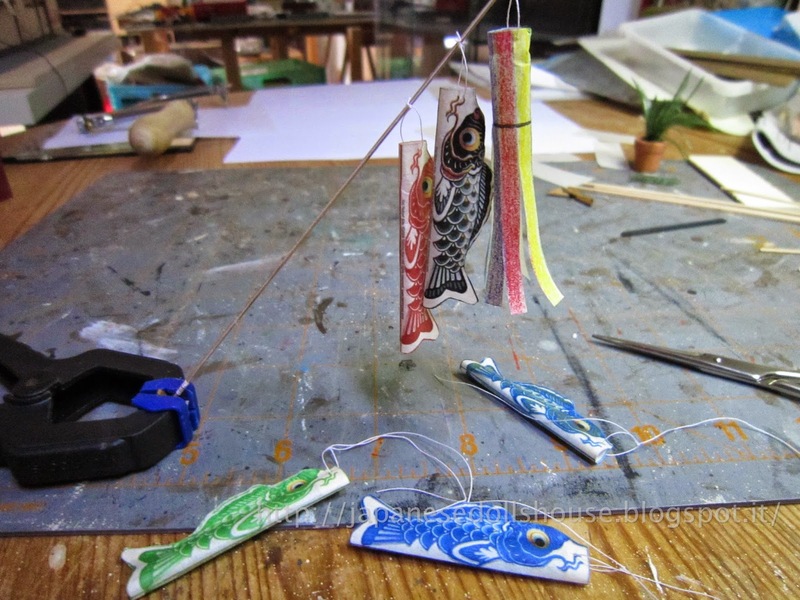 Stringing the koi kites onto the rod support. Kites hanging limp (no wind) outside the bamboo room. Next up I wanted to make a shelf for the fire pit room. I had more objects from Elisabeth Causeret that I wanted to put on display so I decided to make a shelf for them. 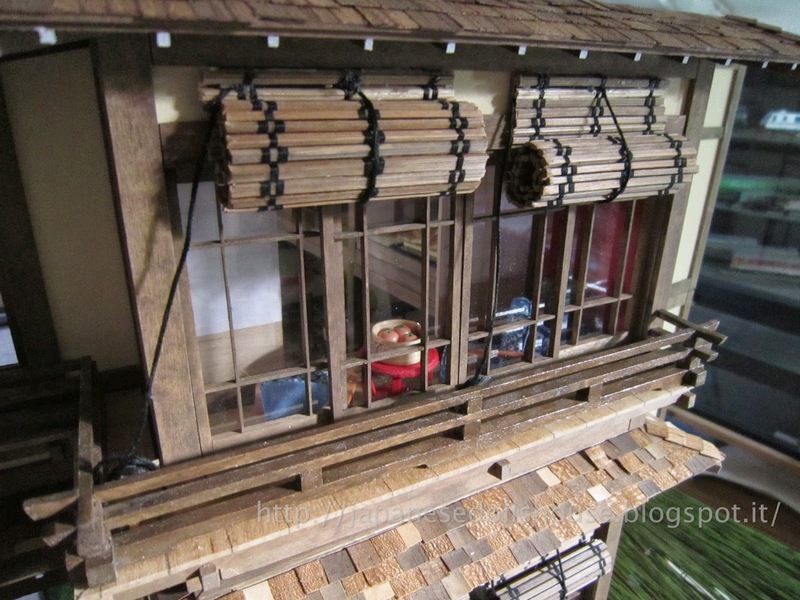 I had recently found another miniature site (mostly ship building materials in smaller scale) but since there were a lot of materials that could easily go with my 1/20 scale I ordered some things. One was a walnut panel 3mm thick so this would be perfect for the shelf. I used some of the walnut cleats I had purchased too (see below regarding the cleats) and shaped them as a false support under the shelf. More decoration than anything. Then I varnished it lightly to bring out the dark color. I love walnut. 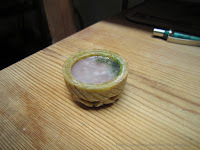 I then glued it in place (using some of the sticky wax to hold till the glue set). I then had some other things I wanted to do in this room so I waited before loading up the shelf with its precious items. On the left a sanded walnut cleat that I used as a shelf support. Shelf in place and drying before adding objects to it. Regarding the cleats, I bought them because I wanted to use them to hold the rope from the bamboo shades on the outside of the porches. This way, the string is wrapped around those instead of just tied to the bannister. I think they look cute and it cleans up the messy look on the front of the porches. Gluing the cleat in place. Wrapping the blind's rope round it. Basically I have problems with available tools. The walnut is pretty hard to hand drill so I broke out my cordless drill. There were some small bits so I measured out some circles and started drilling from small to large. Obviously the last bit was still too small for the overall hole opening so I found some bits in my Dremel type hand tool that would plain out some of the wood and sand it down into a circular hole. 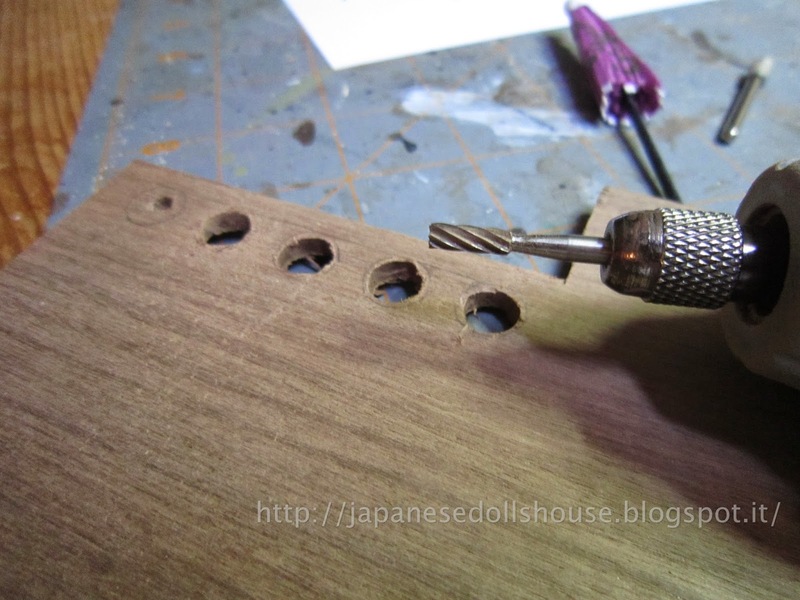 Still, the final sanding of the holes would have to be done by hand. So I wrapped a paint brush with some sand paper and just sanded the holes. Plaining down the inside of the holes. 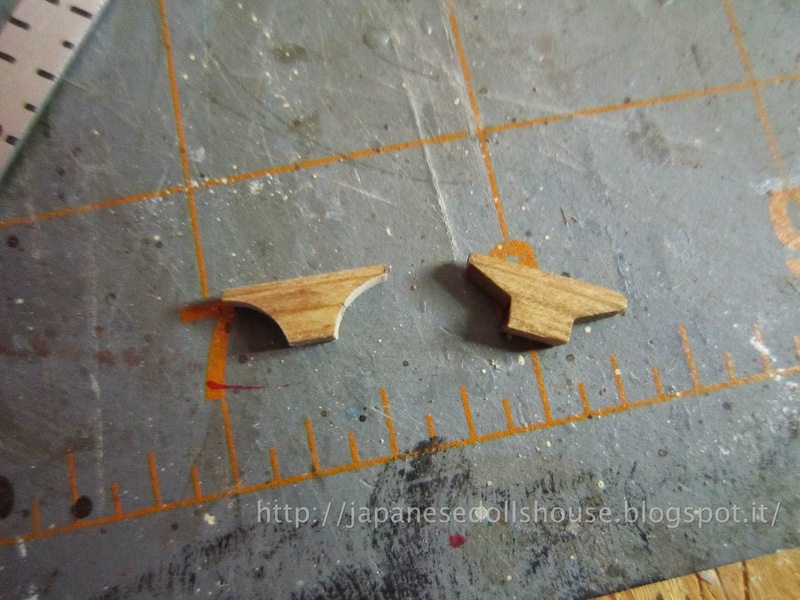 I then had to cut the side support pieces which was slow and also a bit imprecise. One day I will invest in a mini table top vice. 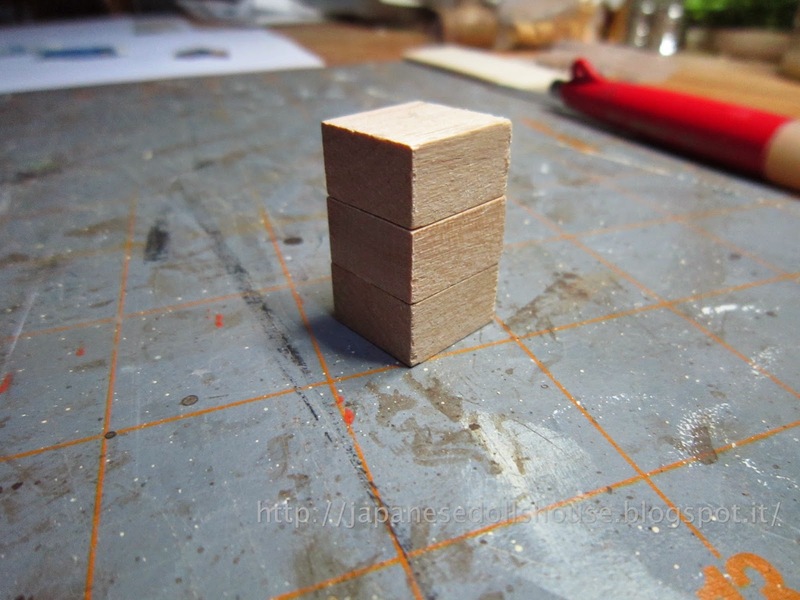 Anyway, I cut the pieces then sanded the edges and did my best to match up the sizing. I then glued the hole panel onto the side panels. Next up was making the slots for the handles. That was a chore. I had to first use a saw then I had to chisel out a bit more as the umbrella’s toothpick size was a bit bigger than the slots. After I could finally measure out and position the support piece onto the stand. 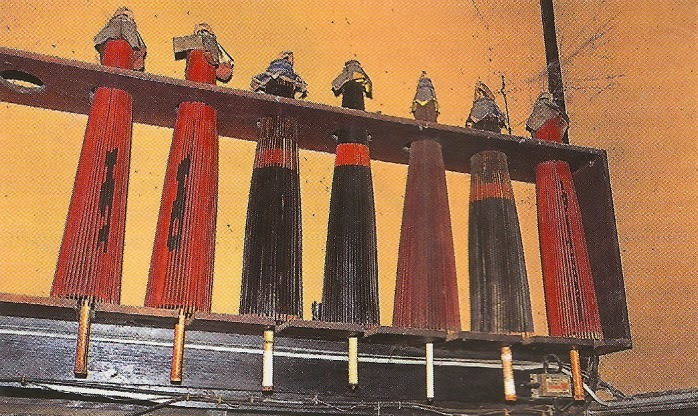 The bottom of the umbrellas (cocktail umbrellas by the way) would be resting on the support shelf. So I had to trim back my handles a bit. Then I painted them after matching them all up. I had seen in the pics that in some inns they actually have rain gear that you can use so I chose my four umbrellas (orange) and tipped them with bright orange as well. 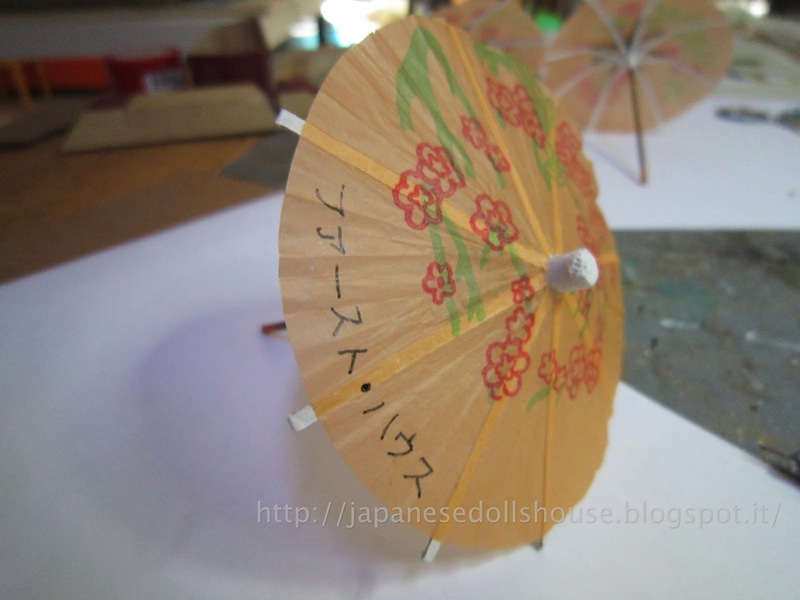 I managed to find in my files the kanji lettering for “First House” and traced it onto the umbrellas. 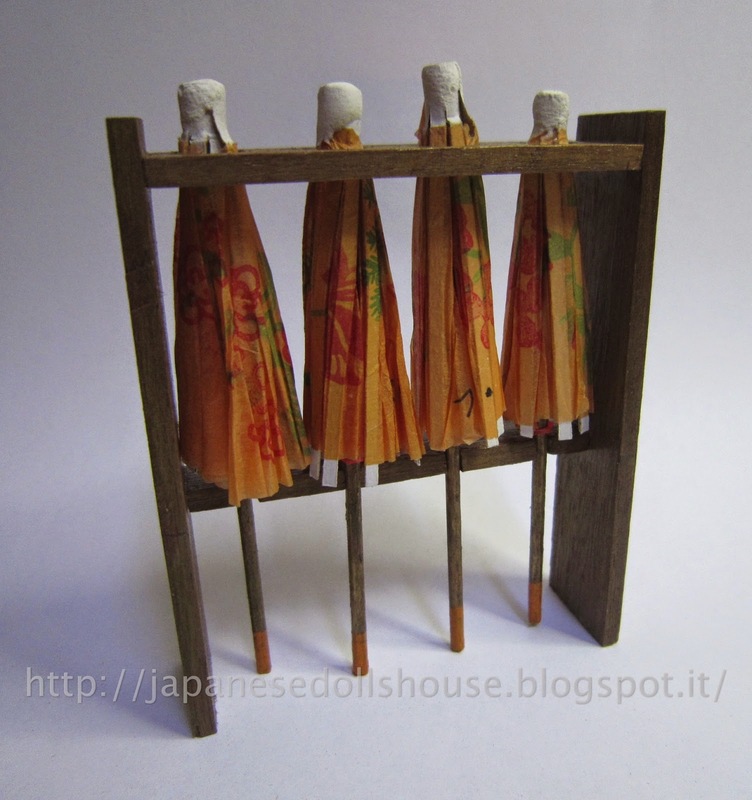 I then had to varnish the handles of the umbrellas and the stand obviously. 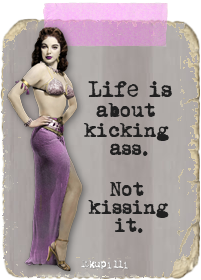 And that was that!! The umbrellas are now available for guests! 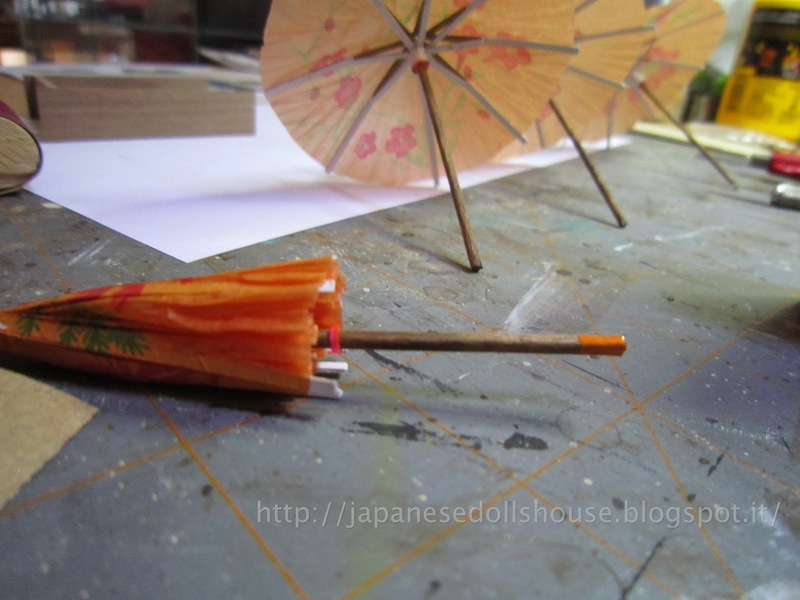 Staining and painting then varnishing the umbrellas. Marking them for the ryokan. And the stand set up in the foyer. And as the final intermediate project, I wanted to make another lamp but I wanted a floor lamp instead of a hanging lamp. I had seen some nice shades on the internet and I liked the idea of a branch. The firepit room has the giant tree beam running across the ceiling and the firepit itself lends itself to an outdoor kind of feeling. 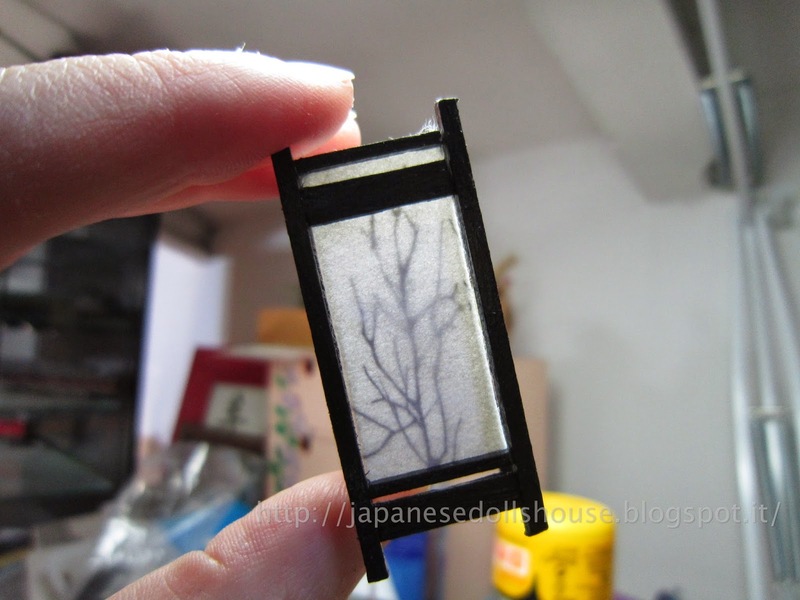 So the tree branch decoration would look very nice in there. First I had to drill a hole in the back wall to accommodate another LED light which was done with some little difficulty. I was eyeballing the hole and missed of course. So that can be covered up in the back later. I finally got the hole drilled in the right place and inserted the LED adding a little sticky wax to make it stay put in the position I wanted. Three stacked block for support from the inside. The lamp construction was exactly the same method that I had used before only this time it had to be taller. So I put three of the little blocks together to make the inside support for working on the lamp. 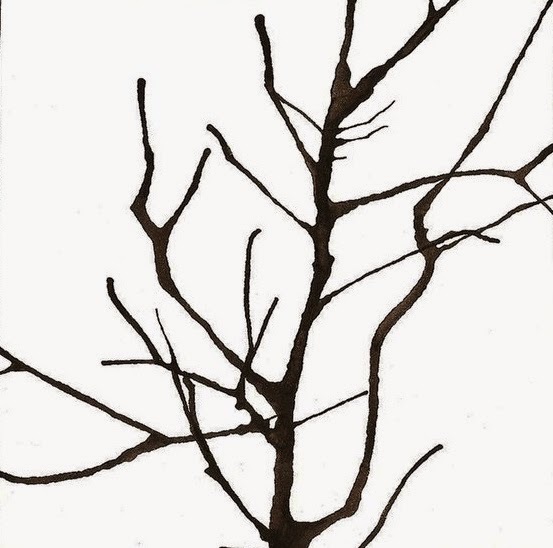 I then found a nice black and white branch design (see above) and made a flipped version of it too. 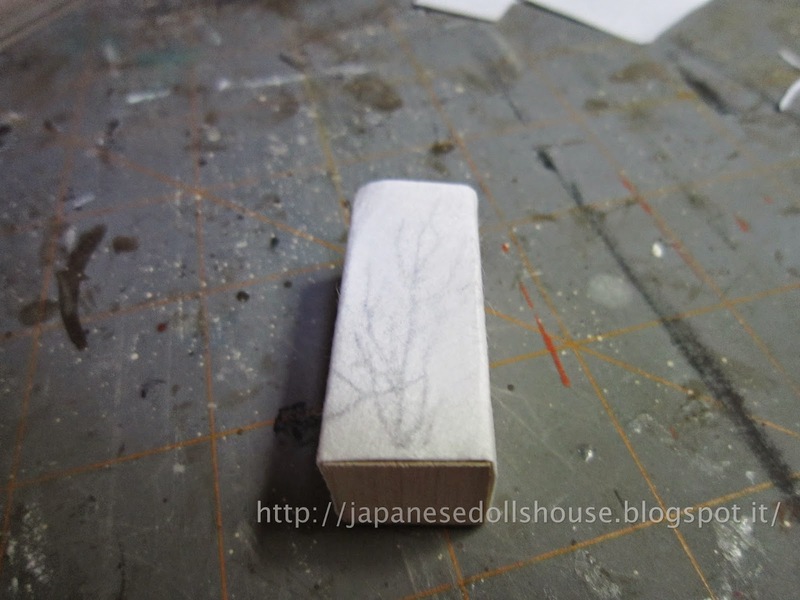 I measured the blocks and how tall I wanted the design to be and printed it out on some of my shōji paper. I touched up the design with some random branch extensions so the design didn’t seem too similar overall. I then wrapped it round the blocks and found more leftover pieces to make the supports and side pieces as well as some little decorative pieces. It wasn’t easy since my hands can’t handle such small pieces all the time but after a lot of patience and gluing, I got it done. I then touched up the black areas and varnished it and placed it in its position. 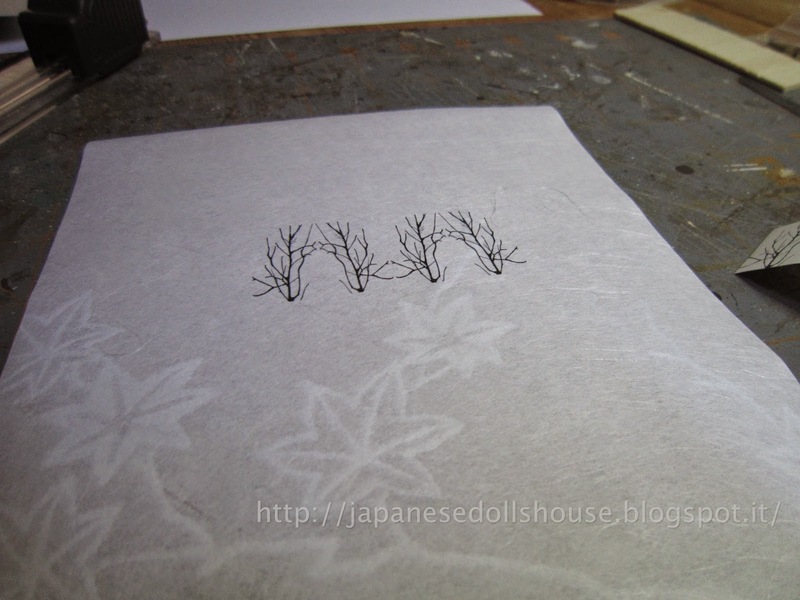 Printed out on the shōji paper. Wrapping around the blocks for support. I think it came out really well. I then put the ceramic objects onto the shelf and once lit, it lights up these as well. You can see the cracklé in the ceramic! Gorgeous. Check out the cracklé on the ceramics. Really lovely! And the kites are on the wall! I have one more object I want to place in this room but it will have to wait. I must get back to tiling if I want to stay on schedule! And sorry for the long blog post. I was feeling very creative this week! Peeking thru the front doors to the foyer and my new umbrella stand.